Lavender Hill 1983 by Christine Thomas. Household Paint (Oil Based?). This Garden of Eden scene is appealing in more ways than one! 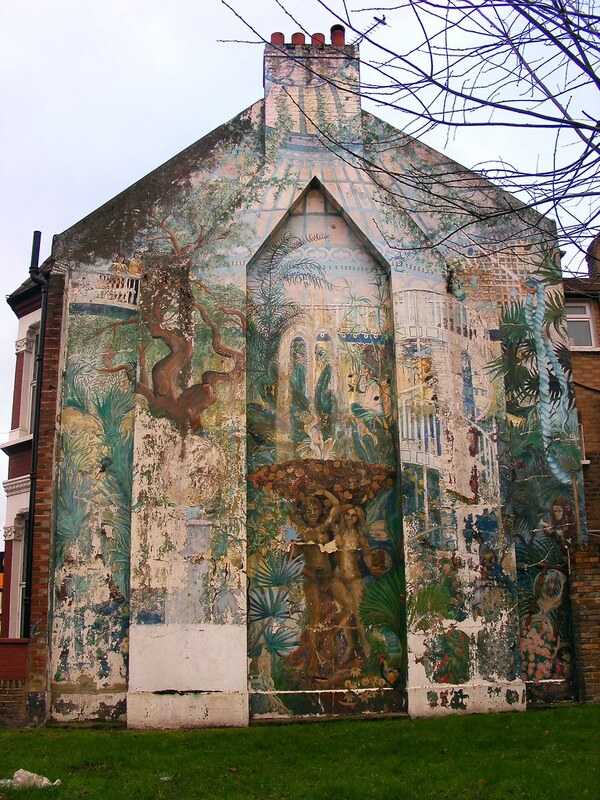 Located on Elspeth road and Lavender Hill, is a large mural situated on a gable wall. It was designed by Christine Thomas in 1983 and painted with the Wandsworth Arts Resource Project. Unfortunately due to the nature of the wall and the paint the mural is peeling from the wall. Some sections of it remain in good shape however the majority are falling apart and it won't be too long before not much is left to see. The mural is based on the hothouses at Kew Gardens and features an abundance of wildlife with an Adam and Eve sculpture as centrepiece. To the right of the mural is an egg timer - it could almost represent the limited time left of this mural life! The mural was the first to be funded by the GLC (Greater London Council). It took six months to complete and in September 1983, it was opened by David Bellamy. Now in a very poor state and impossible to repair, go visit it before it has totally disappeared! The mural has peeled away from the wall. It is unlikely to be repaired. Come out of Clapham Junction Station. Take a left and walk up towards Lavender Hill. walk for about 5 minutes til you hit the Junction of Elspeth Road and Lavender Hill. The mural is located on a gable wall on Elspeth Road.